Doing daily kitchen tasks such as cutting meat often leaves your hands quite dirty and full of bacteria which you may easily transfer to your faucet when you use it to wash your hands, foods, pots, etc. Also, often your hands are just too full to even be able to access the faucet. Motion sensing faucets were designed to make your time in the kitchen more efficient and safer from a sanitary point of view. 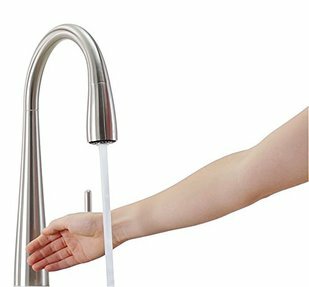 These faucets free your hands by activating water flow based on simple hand movements, so that you can accomplish your kitchen tasks with greater speed and efficiency, without having to touch the faucet handle and without having to worry about spreading germs and bacteria to others. They mostly run on AC current, but some battery run models also exist. High arc design to provide the height and reach to fill or clean large pots. Pull-down spout to provide ample maneuverability for cleaning or rinsing. Control buttons on the spout for steady stream and spray modes. Ability to disable motion sensing when required. Manual override: At any time, you should be able to use the faucet's handle to turn the faucet on or off, or to adjust the water flow and temperature. The handle should always override the sensor mode. This is also required so that the faucet still works when there is no current. This article will compare Moen 7594 Arbor, Pfister LG529 Stellen and Kohler K-72218 Sensate touchless motion sensing faucets. These were not just the most popular among Amazon customers at the time this article was written, but they had also received excellent reviews from most Amazon buyers (an average rating of at least 4.5 stars each out of 5 stars!). The Moen faucet is equipped with two sensors: One is on top and the other in front of the faucet. The top sensor turns the faucet on for about two minutes and is used to fill large pots, to clean the sink, etc. To activate it or stop it, you just need to pass your hand over it. The bottom sensor turns the faucet on only when something is placed in front of it, for example, a glass for filling or your hands for washing. ​The Kohler and Pfister faucets, both have only one sensor. When you wave your hand in front of the sensor water starts flowing and continues until you wave your hand again. All three faucets considered here are equipped with a pull-down spout that features a braided ultra-flexible hose. All three spouts have buttons to operate them in either stream or spray mode, both in the pullout and retracted positions. This allows you to toggle between spray and stream modes right in the palm of your hand for efficient rinsing, cleaning, and filling functionality. All three faucets use advanced docking technologies, so that their spout smoothly glides and securely docks by itself into place after use, without additional assistance (proprietary docking technologies used: Relflex for Moen, AutoDock for Pfister and DockNetik for Kohler). The Moen and Pfister faucets are also equipped with a pause function. When the nozzle is in the pullout position and you’re cleaning the sink or filling a large pot, you can easily pause the water flow as you are moving the wand over the counter or for any other reason you may need. With the Moen faucet, you can disable motion sensing by simply holding your hand over the sensor you want to deactivate for 5 to 10 seconds. This will disable motion sensing, and you will have a regular faucet. To reactivate motion sensing, hold again your hand over the sensor for 5 to 10 seconds. ​To disable motion sensing on the Kohler faucet, you will simply need to turn manually the handle to the off position. To re-enable the sensor, you will need to turn the water on using the handle and then shut the water off again by placing your hand between the "U" of the faucet neck. With the Pfister faucet, leave the handle pulled to the side to operate in touch-free mode. Push the handle in to deactivate the sensor and use the faucet in manual mode. 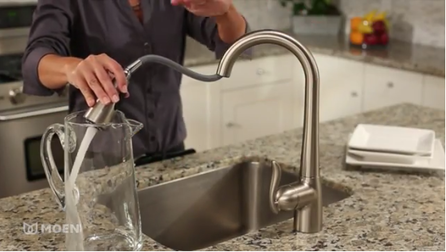 The Moen faucet automatically shuts off water flow after about 2 minutes of inactivity, the Pfister faucet shuts off after 3 minutes, and the Kohler faucet shuts off after about 4 min. With the Moen faucet, there is a dial on the control unit, under the sink, that can be used to set the maximum temperature. ​With all three faucets considered here, the actual temperature when water is flowing can be controlled by using the handle or lever that is on the side of the faucet. All three faucets considered here allow you manual use as a regular faucet at any time. Note that if there is a power outage, the faucet must be used manually by turning it on and off with the handle like a normal faucet. The Moen faucet requires 6 AA batteries. They are included in the purchase. But you can buy the Moen 169031 or 177565 AC adapter kit to eliminate the battery requirement (see the Amazon products section below for the Moen adapter). 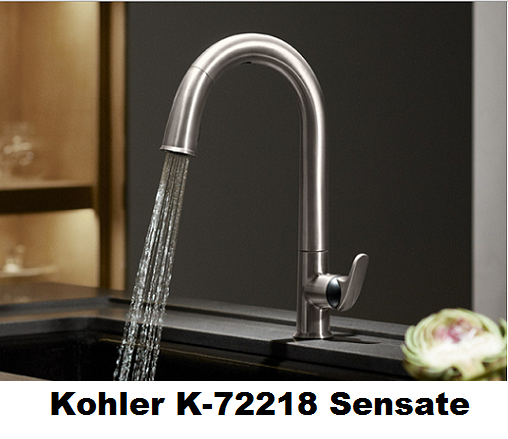 The Kohler faucet is A/C powered, no batteries are required (A/C pwer adapter included). The Pfister faucet is also A/C powered (A/C power adapter included), but an optional battery pack is available (see the Amazon products section below for the Pfister optional battery pack). The Moen faucet comes in chrome, oil rubbed bronze, spot resist stainless, classic stainless steel and matte black. The Pfister faucet comes in polished chrome. The Kohler faucet comes in polished chrome, polished chrome with black accents, vibrant stainless or vibrant stainless with black accents. You can install these three faucets on countertops with one or more holes, but if you have more than one hole on your counter, you will need to buy hole plugs or an escutcheon (a hole covering plate) for the remaining holes as these faucets only use one hole. Note that Moen includes an escutcheon with the purchase of the faucet. GPM = Gallons per minute. The Moen faucet comes with a limited lifetime warranty to the original owner. The Pfister faucet comes with a limited lifetime warranty as long as you own your home. The Kohler faucet comes with a limited lifetime warranty. So which of these three faucets to get? 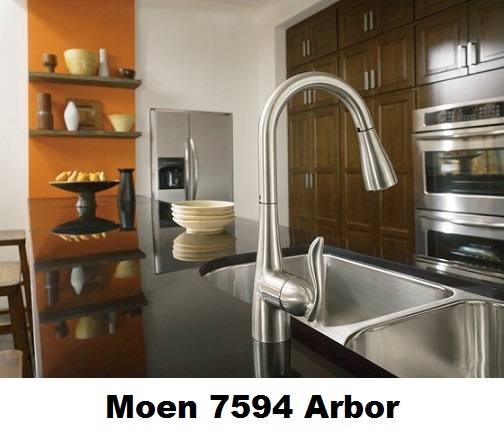 Moen 7594 Arbor is the only one of the three that is equipped with two sensors. While some may argue that there is really no need for having two sensors, and that one is enough to accomplish most tasks, there is no denial that having two sensors gives you more flexibility and freedom to execute the various tasks you need to do around the sink. In particular, it is quite convenient and pleasant to be able to fill a glass of water by simply placing the cup in front of the faucet, with no need to wave hands or anything else. 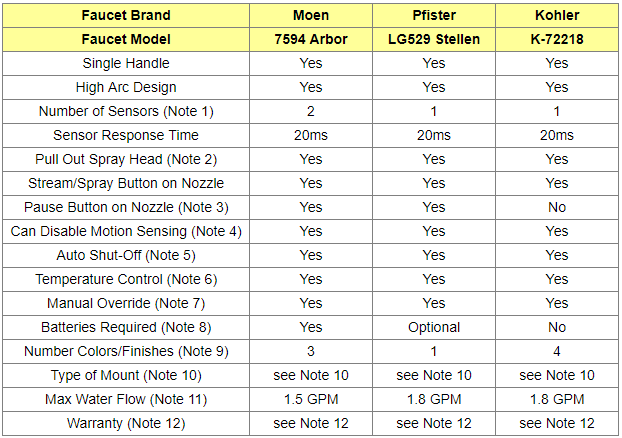 Both Moen 7594 Arbor and Pfister LG529 Stellen come with a pause fucntion on the nozzle which you may find handy when the nozzle is in the pullout position. It will allow you to execute properly your tasks by turning off the water as needed, in particular when you are cleaning the sink and washing pots, since you don't want to wet the kitchen counters. If you are looking for a battery powered motion sensing faucet, you should opt for the Pfister LG529 Stellen which is the only one of the three that gives you the option of using batteries. Note that, at the time this article was written, Amazon users had provided gerat reviews for all three faucets and given an average rating of at least 4 stars out of 5 stars to each. So, you will not go wrong by getting anyone of these three faucets! Please click the faucet of your choice below for price information or to purchase. Note: When you click this product you will be offered different types of colors/finishes whenever they are available.